This is volume 2 in what I will become a series of Tools for the 21st Century Teacher eBooks. I have made this available through Issuu again and also made this document available for download. So if you visit My Library where this is stored, you will see an icon to download it as a PDF at the bottom. Fur.ly is another site offering users the ability to shorten multiple URL's into one. You can find previous posts where I discuss these services. Fur.ly is not much different. You copy and paste several URL's and then it provides you with one short URL. When you visit the URL it created you then view each website in a slideshow fashion. Fur.ly does allow you to open links you shortened in a separate window and it also provides a drop down menu to each long URL you provided. An added bonus is that you also receive stats to determine how often they have been viewed. These stats will help you determine whether students are accessing the links that you have provided them. Personally, I was never really that good at art. I remember one time doing a stencil drawing of a still image and being impressed with my skills...after that, it all went down hill. Needless to say, my artwork at 4 was better than at 14. Psykopaint is a website for those of us that have a limited ability to think abstractly or understanding colors and shading. We also might struggle understanding the different styles of art. With Psykopaint you can upload and photo and turn it into a fascinating work of art. From the picture the software knows what colors go where, you just determine the style. When you are finished you can pay to have your artwork put on a canvas, thus making it a great gift idea. So what about classroom use. Psykopaint would be a great way for Arts and Humanities teachers to discuss the various styles of art, both modern and contemporary. It might be a neat way to take images that you share in class and change the appearance and then have students guess what they are looking at, and then reveal the original, especially famous people. The site still takes some artistic creativity, but at least you can start with something instead of a blank canvas....but the site also allows you to use a blank canvas if you so desire. 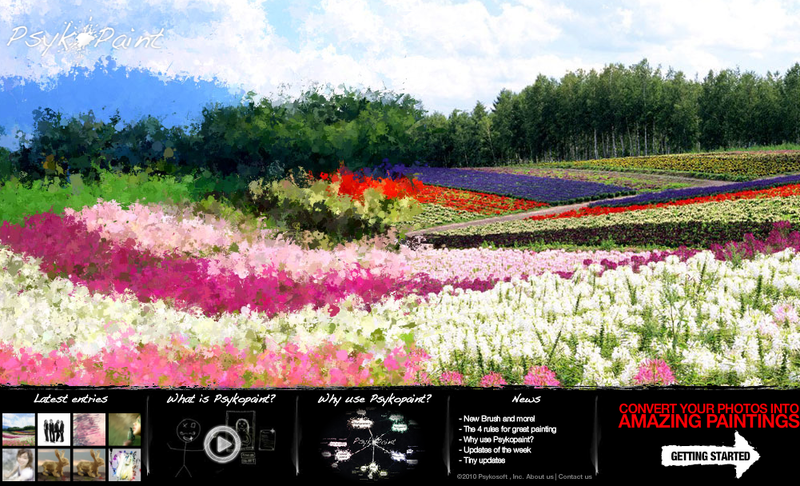 Just visit the front page of Psykopaint and see the samples and play around with the samples. "Kideos is the premier destination for kids to safely watch videos online. Each video on Kideos has been screened by our Video Advisory Council before it makes it onto our site. Our goal is to empower parents to feel comfortable allowing their child to spend time on Kideos, while also making sure children have a thoroughly entertaining experience." Kideos provides videos for various age groups from 0-2 to 9-10. There are various channels that you can search through to find videos that you are looking for as well as the ones that are rated most popular. Think of Kideos as a combination of YouTube and Hulu. There is also an iPhone App available so kids can watch videos on the go. I know I normally focus on Secondary resources, but this seemed too valuable to pass up...especially since my wife teaches 3rd grade. A year later it is interesting going back and looking at what you said, sites you found, ideas you had, and "re-reflecting." In February 2010, I was still fairly new to the whole blogging and Twitter experience, so much of February focused more on what I was experiencing in my new job and new Professional Learning Network. So here are some of the best posts from February 2010 and a short description. 1.) Integrating Technology One School at a Time - Discussing with my readers what my new job was and how my district was working to integrate technology. 2.) My First #edchat - A reflection on my participation in an #edchat and how it made me reflect on how I reflect. 3.) Oh Come On...Not Another Power Point - A post encouraging the use of Web 2.0 tools in place of Power Point. 4.) How Do You Reflect? 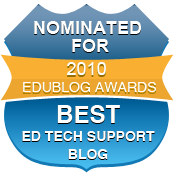 - An extension on my post about #edchat and encouraging teachers to reflect through blogging and encouraging administrators to encourage teachers to blog as a form of reflection and observation. 5.) Facebook 4 Education - There was a lot of negativity in the news about Facebook and how teachers and students were using it inappropriately. I created a wiki with the goal in mind of promoting the positive use in classrooms, schools, and districts. Since that time, Facebook has taken off from an education stand point. I wish I had more time to update it though. Hopefully some of you all can help! If you have a blog, what were you writing about a year ago? I have created several Google Docs that will be updated monthly with Core Subject Resources, but I still wanted to continue with my weekly updates as well. Many of these resources will be added to the Google Docs later. 1.) Random Logline Generator will create a random sentence or topic that you can utilize in the classroom for students to write freely and creatively. It will provide students with a good starting thought point. 2.) QuietWrite is a site that you could use in correlation with the resource above. QuietWrite removes the editors so that you can focus on writing. Create an account and it saves your writing, and it saves it automatically as you type. This would be a great way to create a blog as well. You can export to a WordPress blog and even edit the writings on an iPad. 3.) From Read Write Think comes an Acrostic Poem generator and and interactive. The interactive goes through the steps of creating an acrostic poem. They also have the same interactive available for a Diamante Poem. If students are not working on a Poem, they have also created a Letter Generator interactive as well. 1.) Whiteboard Resources offers flash based games and interactives for math teachers. You can find interactives separated by content and curriculum area. Each interactive comes with a short description of who can use it and what it is. 2.) A Complete Source of Online Math Tools offers 100s of resources for math teachers separated by subject matter. This would be a great starting point for math teachers looking to integrate web based resources into their math curriculum. 3.) Virtual Math Museum is a website that takes several aspects of mathematical formula and used them to "create art." 4.) The University of Mississippi has an online Math Contest where students and classes can answer a problem of the week and when they solve it correctly have their name and location added to a list. Also available are Algebra, Middle School, and Elementary based math problems. To learn more about the program, watch the video below. 1.) Google Sky is like Google Maps for the Solar System. You can examine the Constellations, Hubble Images, and several other aspects of our solar system. 2.) :60 Second Science is a video competition for students to submit science videos. There are several other resources available on this website and you can also find the rules for the contest. 3.) Sumanas Multimedia Development Services offers animated tutorials in a variety of formats for the various scientific disciplines. The Science in Focus section offers animations for science that is currently in the news. 4.) The Biology Project is an interactive online resource for learning biology developed at The University of Arizona. The Biology Project is fun, richly illustrated, and tested on 1000s of students. It has been designed for biology students at the college and high school level. 5.) DnaTube is a scientific site providing video based studies, lecturers and seminars. One of the best features of the DnaTube, is that it supports other types of scientific works through flash animations, powerpoints, in addition to videos. 1.) The United States National Archives has a valuable and useful YouTube Channel worth checking out and bookmarking to share videos with your students. 2.) A growing area of study in the Social Studies classroom is the Middle East, and thankfully there is a site for Teaching the Middle East which provides links, resources, and activities for teaching this part of the world across the social studies curriculum. 3.) A great video that explains the Civil War in 4 Minutes. Great for an introduction or a review. 4.) Picturing America, from the National Endowment for the Humanities brings masterpieces of American ar into the classroom. Students can gain a deeper appreciation of our country's history and character through the study and understanding of its art. 5.) DataMasher provides the data available from the United States and allows users to create mashups to visualize them in different ways and see how states compare on important issues. Users can combine different data sets in interesting ways and create their own custom rankings of the states. 6.) ARTSEDGE: Multimedia Library is a website that provides images, audio stories, music, video, and interactives from the Kennedy Center. There are valuable resources for teaching about the arts as well as lessons for educators. 7.) The Old Photo Album provides a walk down memory lane by providing vintage photography of war and everyday life. You can search through the photos by category or by tag. It is a blog that has been around since April of 2009. Visitors can submit photos as well. A great primary source website. Bab.la offers translations in many different languages, ranging from colloquial and regional expressions to more technical or field-specific vocabulary. Special features include search filters, synonyms, pronunciation, sample sentences and much more. - Scene Skipping - Like DVD chapter buttons, use the wizard to mark notable parts like game highlights, changing performers, and lecture sections. - Movable Zoom - Dynamically magnifies the area you point over. Use it to get a close look at objects, writing, and things like moving athletes. - Slow Motion On-Demand - Instantly watch videos at a slower rate to more clearly see what happens. Using EmbedPlus is as easy as copying and pasting a URL from YouTube. From there choose your size, Start time, and Scene Markers. You then choose your annotations and then are provided the code and URL. See a sample video below. Quicklyst is a website that allows user to easily take notes. It looks and has a similar feel as another note taking web-based app WorkFlowy, but it has more features.. The application requires no registration or login to get started, although that is still an option so that you can save notes for the future. Cramberry helps you study with online flash cards, similar to Quizlet. Students can make cards on Cramberry, or choose from our catalog of free public flash cards. The difference is that when you study, Cramberry analyzes your progress using an algorithm and presents those cards at intervals for maximum retention. Signing up for an account is free and simple. The interface is also simple to use as well. If students don't feel like making a list, they can search the public library and find a list of vocabulary for the words that they are needing to study. Another benefit of Cramberry is that it also has an iPhone and iPad app so that you can take your studying with you. Writeboard is a shareable, web-based text document that let you save every edit, roll back to any version, and easily compare changes. You can use Writeboard in a solo effort or in a collaborative effort. For each Writeboard you provide a name, a password, and your email address. When you write something you can share it, revise it, compare it, and then store it in a virtual backpack to help keep them organized. The software allows you to click various versions via a check-box and then you are able to make comparison between the versions and see what has changed. You can subscribe to a document's RSS feed so that you can be notified when changes are made. "Web-Chops is a fun and easy way to collect, organize and share any content found on the web. With web-chops you can save "chops" from web pages to your own custom topic pages. Instead of loosing your way through hundreds of meaningless links on your favourite list, why not create your own custom pages containing the content itself, be it text, video clips, audio, flash applications and forms. The clipped content looks and behaves exactly as it does on the original page. Here are some examples of how Web-Chops can make your life easier:"
- Conduct textual searches through your own topic pages so that finding the right topic page is as easy as a couple of clicks. The Web-Chop tool can be downloaded for both Internet Explorer and Firefox and it will create a toolbar application in your browser. Digigogy - A New Digital Pedagogy is "dedicated to the development of 21st Century Fluencies within a strong pedagogical framework to enhance professional practice and to ultimately do what is in the best interest of students. This certainly includes a multitude of cutting edge technologies, with an emphasis on collaboration, conversation, critical thinking, and global connectivity." After checking out the videos, I suggest spending some time on this site. There are several valuable resources for all teachers as it relates to developing a sound pedagogy while examining the digital impacts on education.